Kell Brook against Errol Spence Jr for the IBF welterweight title at Bramall Lane. Spence took Brook’s world title off him at Bramall Lane, after a punch shattered the reigning IBF title holder’s eye socket. Brook, who had competed well until that point and could have gone on to win, battled on before finally having to concede. If he’d have carried on, he could have been blinded, Brook said later. But Spence, who had been classy in his remarks immediately after the fight, has changed his tune, as he prepares to defend his welterweight title for the first time, against Lamont Peterson in, Brooklyn USA on January 20. Questioning Brook’s heart after such an injury is insulting and vaguely ridiculous. 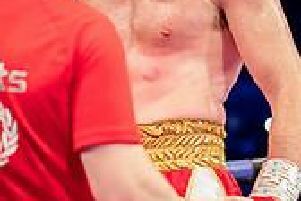 Would Spence had have gone out on his shield had he have suffered a fractured orbital bone - or would he have carried on into potential retirement and disability? Brook will doubtless keep an eye on Spence as he prepares for his defence. It is deemed unlikely that the Sheffielder - who is supporting gym-mate Billy Joe Saunders in his title defence in Canada - will return at 10st 7lbs, moving up to 11 stone and a possible, eventual clash with Merseyside’s Liam Smith. However Brook has reserved his position - if a big fight comes knocking at welterweight, he says he can still operate in that division. The Yorkshireman recently revealed he’d been close to agreeing a fight with Miguel Cotto and would have ‘loved’ to have fought the Puerto Rican in his farewell bout on Saturday against Sadam Ali.